Last week I mixed up some dough and ended up only making the three small pizzas for the girls and the little man because the hubs worked late and I didn’t feel like eating by myself. That meant the next day I had a ball to work with, so we decided to make an appetizer pizza and I just so happened to have pinned the perfect recipe and had all the topping ingredients, to boot. 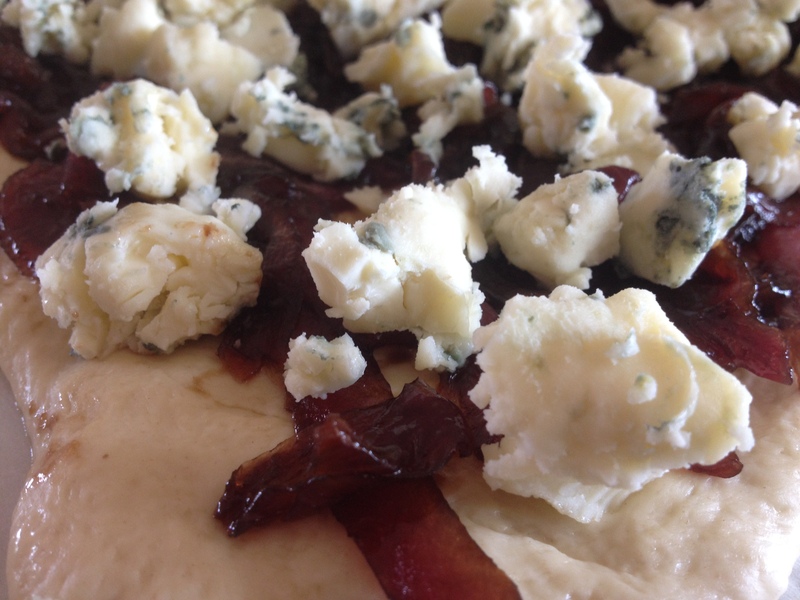 I don’t know about you, but I am obsessed with the tangy flavor of blue cheese. The hubs isn’t even a fan of it and he called this pizza RIGHTEOUS! My tongue was doing somersaults and cartwheels after eating this sweet and salty goodness — I hope yours does, too! 1. Combine the flour, sugar, yeast and kosher salt in the bowl of a stand mixer and combine. 2. While the mixer is running, add the water and 2 tablespoons of the oil and beat until the dough forms into a ball. If the dough is sticky, add additional flour, 1 tablespoon at a time, until the dough comes together in a solid ball. If the dough is too dry, add additional water, 1 tablespoon at a time. 3. Scrape the dough onto a lightly floured surface and gently knead into a smooth, firm ball. 4. Grease a large bowl with the remaining 2 teaspoons olive oil, add the dough, cover the bowl with plastic wrap and put it in a warm area to let it double in size, about 1 hour. 5. Turn the dough out onto a lightly floured surface and divide it into 2 equal pieces. Cover each with a clean kitchen towel or plastic wrap and let them rest for 10 minutes. After I let them rest is when I divided my second ball into 3 equal mini pizza dough balls. Also, you can let the dough sit overnight as well. I left mine out on the counter and it continued to double in size. 1. Set your oven to 450 degrees F.
2. In a large saute pan over medium heat add the olive oil. 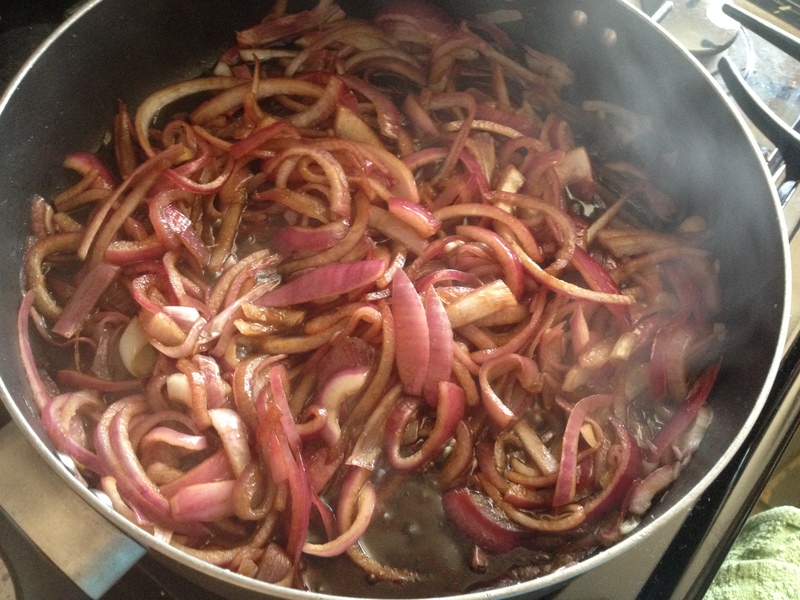 Once the oil is hot, add the onions and salt. 3. Saute the onions until they begin to color, stirring frequently. Add balsamic vinegar and stir to combine. 4. Turn heat to medium-low and cook for about 30-35 minutes. 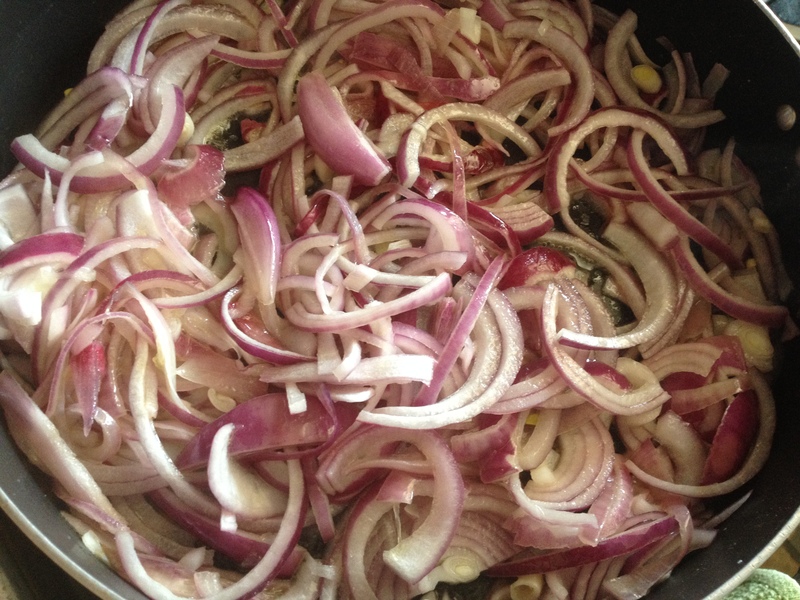 At about the 15-minute mark add sugar (just 1/2 t at a time, up to 2 T — up to you how sweet/salty you want your onions). 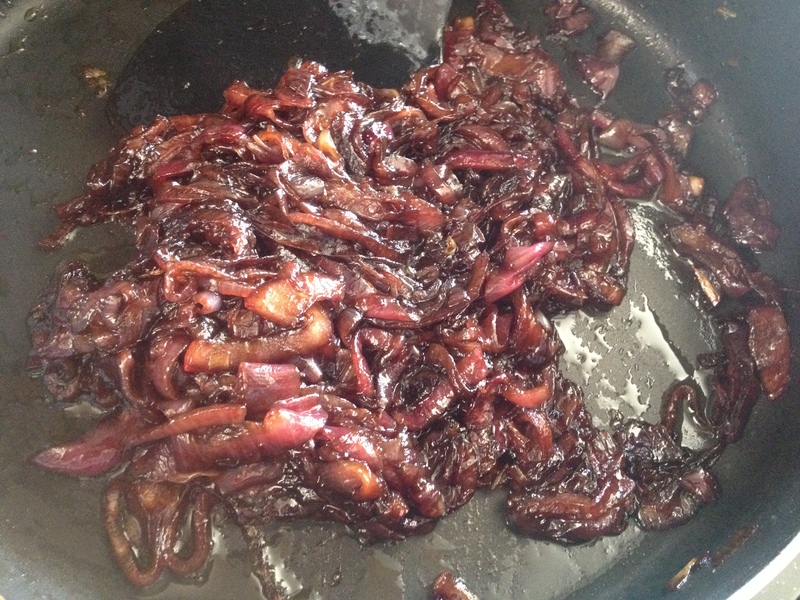 Cook until onions are reduced down and caramelized deeply. Remove from heat and set aside. 5. Place one sheet of parchment paper on a pizza peel or the back of a cookie sheet. Add a little olive oil to the parchment and place dough. 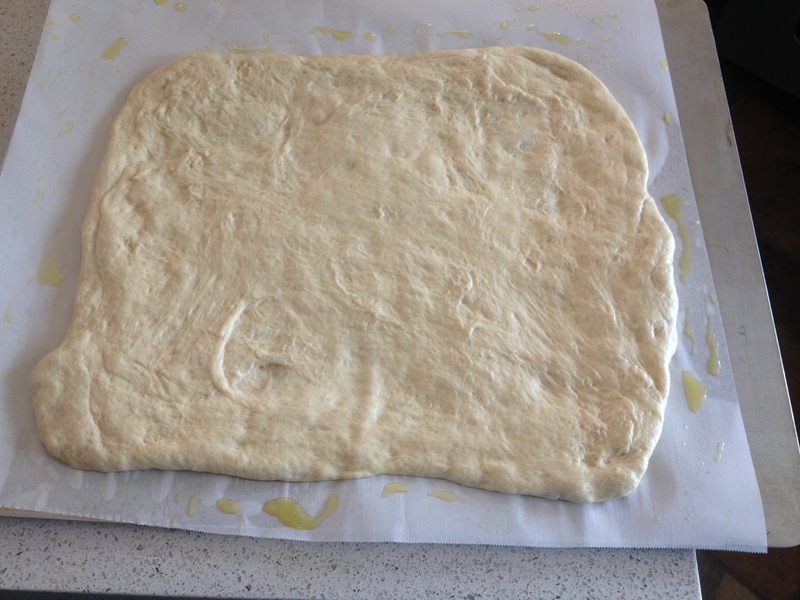 Using hands, gently stretch dough into a rectangle, about 15 inches by 12 inches. 6. 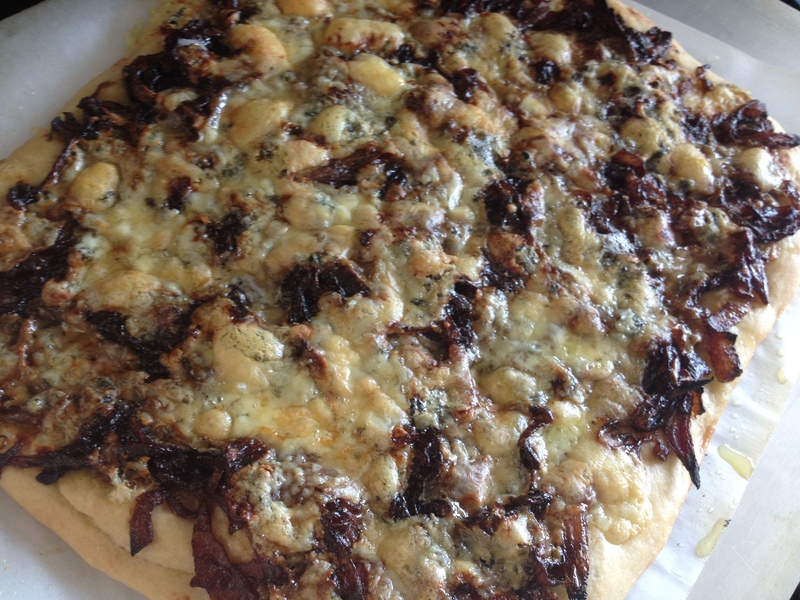 Spread caramelized onions evenly over dough. 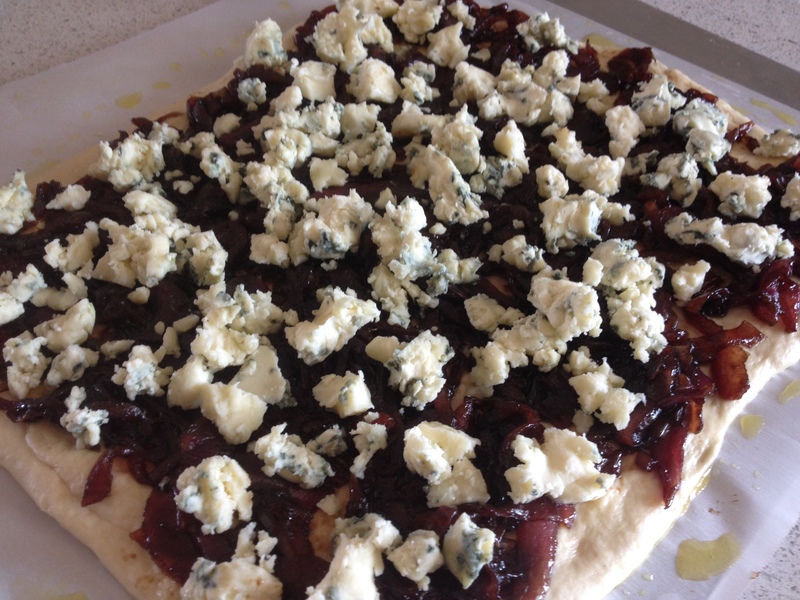 Crumble all but about 1 ounce of blue cheese and sprinkle evenly over onions. 7. Bake for 15 minutes or until the edges are a nice golden brown (I could have probably left mine in a little longer, but I was afraid to overcook/burn it!). 8. 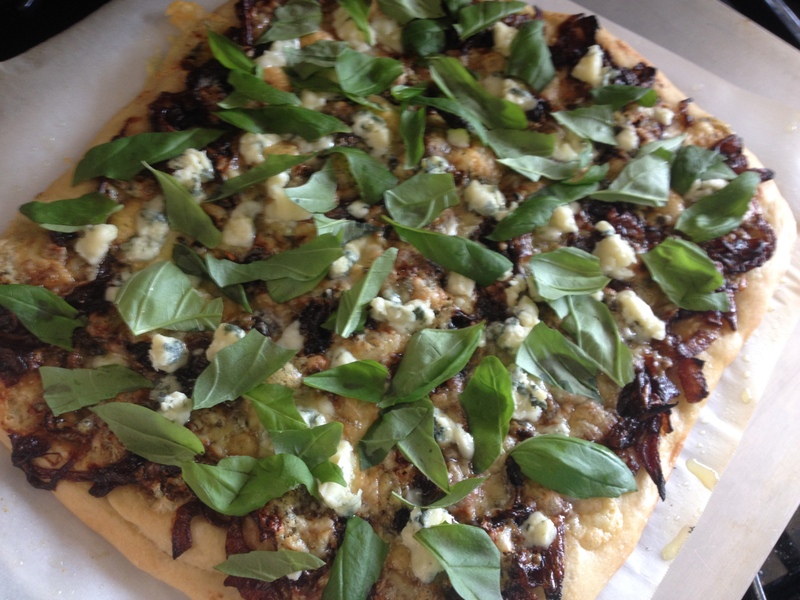 Remove from oven and add remaining cheese over pizza, then add your torn basil leaves. I know you can play around with all sorts of ingredients, but this one was pretty simple and straightforward and I loved that the sauce from the onions served as the base of the pizza. The sweetness of the onions with the saltiness of the blue cheese and the peppery flavor of the basil is a party in your mouth. Like I said, the hubs doesn’t dig blue cheese and he was salivating and elbowing me out of the way to get more. What are your favorite pizza toppings? Do you have any hints/tricks for your pizza dough? Next time we want to grill our pizza (we’re just not sure our twerp of a grill will get hot enough!) and I’ll let you know how that goes.